When designing walkways in corrosive environments such as chemical plants and waste-water treatment plants, fiberglass grating walkways are a long-lasting, cost-effective alternative to steel or aluminium. 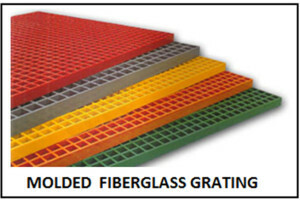 At National Grating we specialize in all types of molded and pultruded FRP grating. Molded grating walkways are typically a lower price than pultruded walkways. The most common molded grating panel sizes are 3 x 10, 4 x 8 and 4 x 12 (feet). Call us at 1-877-984-5421 and we will help you select the panels sizes with the best yield depending on the length and width of the walkway. Molded fiberglass grating walkways provide durable, cost-effective service in tough environments. 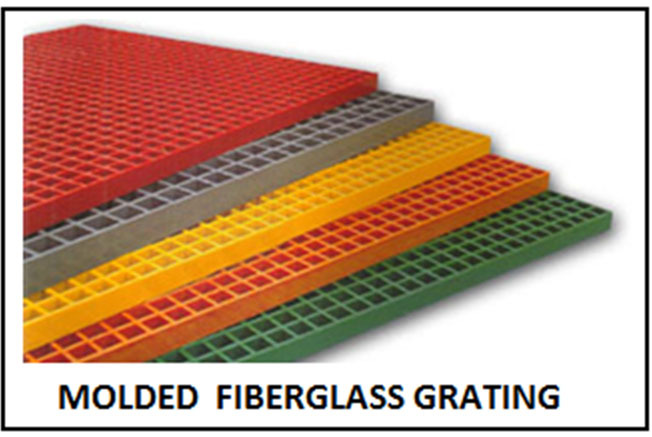 Molded grating panels are 1″, 1-12″, or 2″ thick. 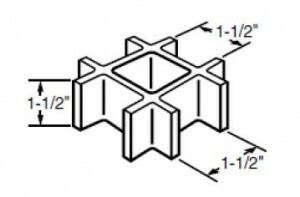 When selecting your molded fiberglass grating walkways, check the weight-bearing specifications and span between the supports in the structure holding up the walkway. The farther the supports are apart underneath the grating, the stronger the grating required. Most of the molded grating we have in stock is Dark Gray and Yellow. We also have light gray, green, and orange for some profiles. Check out our Grating Selection Chart to find the grating that is right for your application. Molded grating consists of a series of 1.5″ squares in a checkerboard pattern. 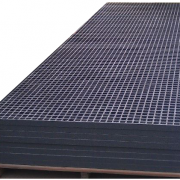 If you need more surface area for your walkway, or you need a stronger grating to span a wider walkway, you may need pultruded fiberglass grating walkways. Pultruded fiberglass grating walkways provide excellent service for many outdoor applications, such as this marina. Pultruded Grating consists of a series of parallel bearing bars separated by cross-rods spaced every 6″. 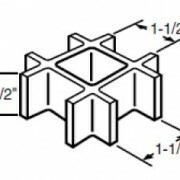 Care must be taken when choosing pultruded fiberglass grating walkways to assess the weight-bearing capacity of the material. Unlike molded grating, pultruded grating is only strong in the direction of the bearing bars. The cross-rods do not provide any support whatsoever. They are only used to keep the bearing bars parallel to each other. FRP Stair treads typically have a nosing on the leading edge to strength the stair tread and minimize any tripping hazard. You will also see the nosing at the beginning of the walkway as well. This highly visible transition is an important safety feature. Ask our service reps about the yellow nosing options available for your pultruded fiberglass grating. This pultruded fiberglass grating walkway material features yellow nosing for high visibility. One of many products from National Grating. 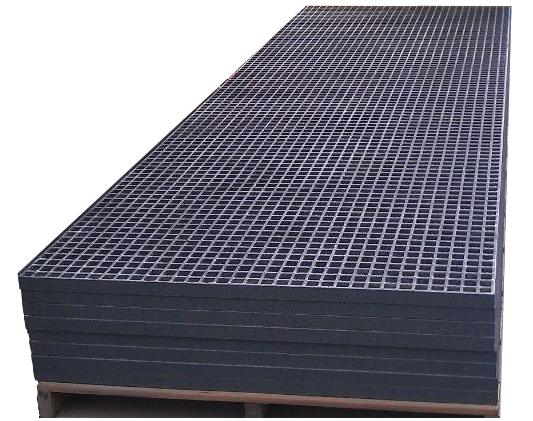 You can either order our FRP grating walkways cut to size at our warehouse, or you can order full panels and cut to size yourself. Check out our video on How to Cut FRP Grating. For all FRP Grating Walkway inquiries, please call 1-877-984-7788 or email sales@Nationalgrating.com or Request a Quote. National Grating provides fiberglass grating walkways to ALL USA States including California, Oregon, Florida, New York, Illinois, Pennsylvania, Ohio, Georgia, Michigan, Virginia, Massachusetts, Arizona, Washington, North Carolina, Nevada, Texas, New Mexico, Indiana, Tennessee, Colorado, Maryland, Missouri, Wisconsin and Utah. Our pricing and service experts are standing by to help to find the best product for your project. With many varieties in stock and expedited shipping, we can supply your project with fiberglass grating walkways at the best price. In today’s connected world, we depend on cellular telephone signals, Wi-Fi networks and over the air radio and television signals. Wi-Fi and Bluetooth connectivity are essential to on-site work environments. Steel structures significantly disrupt these signals. Fiberglass grating walkways are an essential part of FRP building structures that are “electronically transparent” and do not interfere with radio frequency transmissions.